When we talk about books, we generally think only of their inside - the words, ideas and themes that they contain. But what about the outside? Books are objects in the world. They undertake all kinds of work that exceeds just their words - they forge friendships, decorate our houses, store our momentoes and memories. Books also have active political lives. They inspire social movements and bind people together. Books can stand as short-hand symbols for larger galaxies of ideas. A new collection of essays Ten Books that Shaped the British Empire explores the role of books in founding and dismantling The British empire. 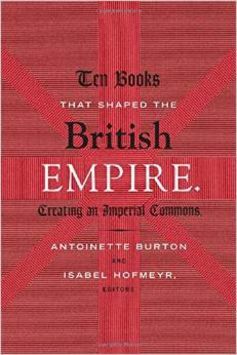 Written by scholars from South Africa, India, Barbados, New Zealand, Australia, the UK and the US, the volume comprises ten essays, each on a book that shaped British imperial life. The ten books include five famous block-busters and five now-obscure texts that in their day were influential. The five block-busters are imperial or anti-imperial classics: Robert Baden Powell’s Scouting for Boys (1908), Charlotte Bronte’s Jane Eyre (1847), Thomas Babington Macaulay’s five volume History of England (1848). The anti-colonial texts are Mohandas Gandhi’s Hind Swaraj (1909) and The Black Jacobins (1938) by CLR James, the famed Caribbean revolutionary thinker. • Edward Gibbon Wakefield’s, A Letter from Sydney (1827) , influential in the colonisation of New Zealand and Australia. • Charles Pearson’s National Life and Character (1893), an Australian book predicting the rise of Asia and the end of the ‘white man’. • Century of Wrong (1899), the pamphlet setting out the Boer cause in the lead up to the Anglo-Boer War. • Totaram Sanadhya’s 1914 Fiji Mein Mere Ekkis Varsh (My Twenty-one Years in Fiji) a Hindi pamphlet opposing indentured labour. • Gakaara wa Wanjau’s 1960 Mihiriga ya Agikuyu (The Clans of the Gikuyu) written in a Mau Mau detention camp. The volume is edited by a radical historian of empire, Antoinette Burton from the University of Illinois and myself, a scholar of print culture and book history from the University of the Witwatersrand in Johannesburg. In our introduction, we say that from the very beginning the book provoked fascination. “Oh wow! Which are the ten books?” was a common response. While everyone had a different idea of which books should be included, our interlocutors accepted the premise that books could change empires. People envisaged a series of big books that founded empires (John Robert Seeley, Charles Dilke, Frederick Lugard were common examples) and a set of equally significant books that ended up dismantling them Frantz Fanon, Amilcar Cabral, Che Guevara). In some cases the influence was direct. In 1901, when Australian parliamentarians debated the Immigration Restriction Bill (a key part of the White Australia policy), the Australian prime minister held up a copy of Pearson’s book and read two passages from it. On the anti-imperial end of the spectrum, CLR James Black Jacobins was widely taken as an allegory predicting the end of colonial rule in Africa. Yet books equally have more diffuse and longer term effects – Wanjau’s pamphlet for example was less concerned with direct action against the British than with undertaking the long, slow work of preparing people for independence. Books were deeply enmeshed with empire and were often used as symbols of British imperial authority, calling-cards of ‘civilization’. As one observer noted, “The English literary text … function[s] as a surrogate Englishman in his highest and most perfect state”. Books were held up as the ‘gift’ of empire and were used to portray colonialism as benign while masking its violent nature. Books and documents were also instruments of ruling – the pass book was used to control the movements of black people during apartheid in South Africa. But books could equally be used by those opposing empire, a provocation to imperial power and a monumental statement of intent. James’ Black Jacobins, an account of the late 18th-century slave revolt in Haiti initially appeared in a handsome 328-edition from Secker and Warburg. Yet, not all of the 10 books started out as books – many began life as pamphlets or newspaper articles, more humble forms which nonetheless exerted considerable influence. Century of Wrong became a calling card for the pro-Boer cause. Scouting for Boys appeared first as a newspaper series and then in small handbooks, a format that helped make scouting an international movement. These texts travelled far and wide at times migrating through different media, appearing as newspaper serials and then rising up into books. Aiding their passage was the vast sprawling periodical and newspaper network that carpeted empire. Hind Swaraj began life in Gujarati in a two-part series in Gandhi’s Durban-based newspaper Indian Opinion before appearing as a booklet translated by Gandhi himself into English. These streams of print culture made up the sinews and arteries of empire, linking its supporters while offering a mode of communication to its opponents. Access to this field of print culture was uneven and unequal, affected by capital, literacy, censorship. Yet, much of this printed matter was not copyrighted – all periodicals for example legally reprinted material from each other. These carpets from https://carpettogo.com/ of print culture created a type of commons across empire, a zone of textual production not owned by one person. Books in empire were dispersed across time and space – they were not bounded events. As instruments for and against empire, they formed part of the sprawling assemblage of the British empire, both extending its reach and limiting its legitimacy.